Mid Pines Inn & Golf Club consists of over 250 acres of the most beautiful countryside in North Carolina. 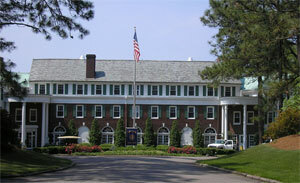 The Georgian Style Club overlooks the vintage Donald Ross designed golf course and is a Sandhills Classic.Mid Pines was purchased in 1994 by LPGA Charter Member Peggy Kirk Bell, her family and outside partners. Peggy Kirk Bell and her family own the Pines Needles Lodge and Golf Club. Nestled among the longleaf pines of the Sandhills area, Mid Pines golf course remains virtually unchanged since opening in 1921. In springtime, the flowering dogwoods and azaleas surround the small, undulating greens and narrow fairways, typical of Donald Ross-designed courses. Pops Lounge, Terrace Dining Room and many of the hotel rooms offer scenic views of the course and practice greens. Step back to the 1920s and experience the way golf was meant to be played.